Acknowledged the world over as one of the greatest, if not the greatest living pianists, Martha Argerich goes from strength to strength as a performer, and can look back (if she cares to) on a career with DG and Philips that comprises one iconic recording after the other. Her essential legacy is with our two labels. If the solo recordings are relatively few in number � each a gem, from Chopin to Ravel and Bach and Schumann � her partnerships with the great artists of her time are unrivalled. One only has to think of Claudio Abbado, Nelson Freire, Gidon Kremer and Mischa Maisky, and more recently Daniel Barenboim. 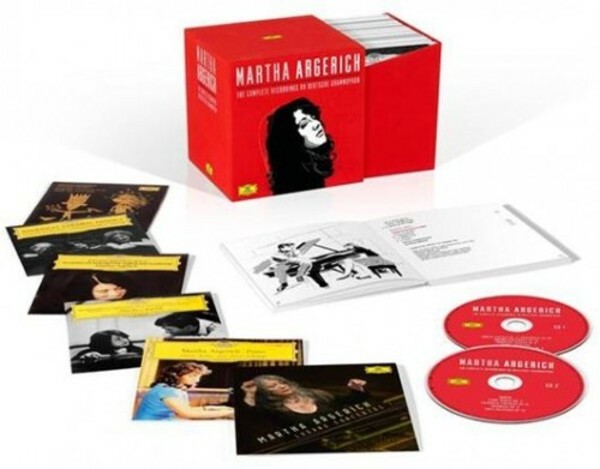 With this box you can trace Martha Argerich's recording career from early Chopin, the famous Ravel and Prokofiev Concertos disc with Claudio Abbado, through her comprehensive series of chamber-music recordings with Gidon Kremer and Mischa Maisky, to the more recent live outings with Nelson Friere (a long-time partner) and Daniel Barenboim. On the way there is overwhelming Rachmaninov, a scintillating Carnival of the Animals, and many more. CHOPIN: 24 Preludes op.28, Prelude in C sharp minor op.45, Predlue in A flat major op.posth.